I know a lot of teachers who are already in planning mode for the upcoming school year. While we might not all be back in our rooms yet (some are! ), many of us are taking a look at the calendar and realizing that school will be in session before we know it. Blink, and summer is gone! We spend a lot of time preparing our classrooms for our students. What decor should I use? Will I have a theme this year? Do I want to change up how I do seating? What discipline plan are we using this year? But, a classroom, as put-together as it may look, is nothing without a great teacher with an amazing plan. And I do mean A PLAN. Not lesson plan(S). Get it? I mean a goal, a mission, an ending point towards which you will strive all year long. 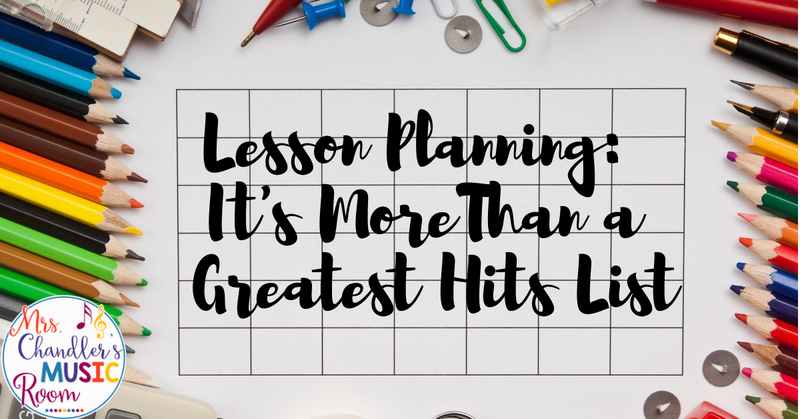 I know many music teachers from all over the country who spend countless hours writing lesson plans. They neatly compose their plans and enter them into their planners with pride. Intentions are good. But...is there always an end goal? I mean, aside from "I want my students to leave me with a lifelong love of music." No. Not always. And here is what I mean. Music class should not be planned like a greatest hits list. "I LOVE this song. My 4th graders will love it too, we are SO DOING THIS next week!". "This professional development is BLOWING.MY.MIND! I am teaching ALL OF THIS next week...". A lot of times, music teachers are left alone as far as planning. Administrators are almost never really aware of what children should learn, when that learning should take place and HOW that learning should look in the music classroom. So, it is very easy to just thumb through your materials and pick and choose your favorite activities throughout the year. I mean, the lessons are PLANNED, right? That's a lesson plan! DONE. Well...ehhh...no. Now, don't get mad at me! I will fully admit that my lesson planning looked a lot like that when I first started teaching. I started out in a district where there was no curriculum. And no, I do not mean "no books" although, that was also true! Curriculum and materials are not the same thing. (Pet peeve of mine, I'll admit that!). What I mean is, there was no standard framework upon which music teachers could plan their year. There was no, "By the end of 3rd grade, students should be able to ________." Now here is where I wish I could get into my school right now and take a few pics of my plan book from Fall of 2002. What did I do that first year? Well, I spent a lot of time in the computer lab of the local university (remember folks, I was poor then and wasn't about to pay for internet at my apartment that I could barely afford, lol!) and I searched and searched and searched for long range plans, random districts' curricula...anything I could get my hands on. Then, I printed it all out. I had binders full of curricula based on different states' standards, national standards, you name it. I just wanted some direction, after all. Then, I went into Lois Choksy's The Kodaly Method I, and I copied every single skill onto my calendar for every single grade level. Honestly, I should have just started with that! Luckily, there are now many more published resources from which to gather a clue (picture me laughing here, you know, because I was clueless). If your district has a well-written curriculum framework with clear expectations of skills for each grade level, please use it. Don't just tuck it away and fly by the seat of your pants. And if your district does NOT have anything, do yourself a HUGE favor and find a great resource where the framework is already laid out for you. The Kodaly Method I (mentioned above), Game Plan (Kriske and Delelles), An American Methodology and it's companion book Yearly Plans (Ann Eisen and Lamar Robertson), Kodaly Today (Micheál Houlahan and Philip Tacka) and many more. I would like to add that I do not consider any of the above to be a "Bible" of music education. I think that there is good information to be gleaned from all of those AND more! The takeaway is, have a LONG TERM goal, then do the little things that will take you towards that goal. You can use those favorite lessons when the time is right, don't worry! Here's to a great year of planning! These are some great ideas. I would have shared this with a teacher I know, but she probably won't benefit from this as she teaches high school students. Great work anyways!